Our first match up the night was Flash Morgan Webster vs. Wolfgang. Not the longest match, but it was good while it lasted. You know, I’m not understanding the point of this Gallus faction if they never help each other. What’s the point in strength in numbers if your not going to use your numbers? Anyways, there wasn’t much downtime during the match. Webster had a handful of dives outside the ring. Wolfgang did some moves to show off his size difference. There was good chemistry overall and probably Wolfgang’s best match since being with Gallus. The match ended with Wolfgang running Webster into the steel post while holding him in a power bomb position , then finishing the power bomb on the apron. That thud was devastating. Wolfgang rolled him in the ring and finished him with some type of modified suplex that ended up with Morgan landing on his stomach. After the match Wolfgang landed a couple more punches then left. After the match, Kassius Ohno had a promo and talks trash about NXT UK competitors. 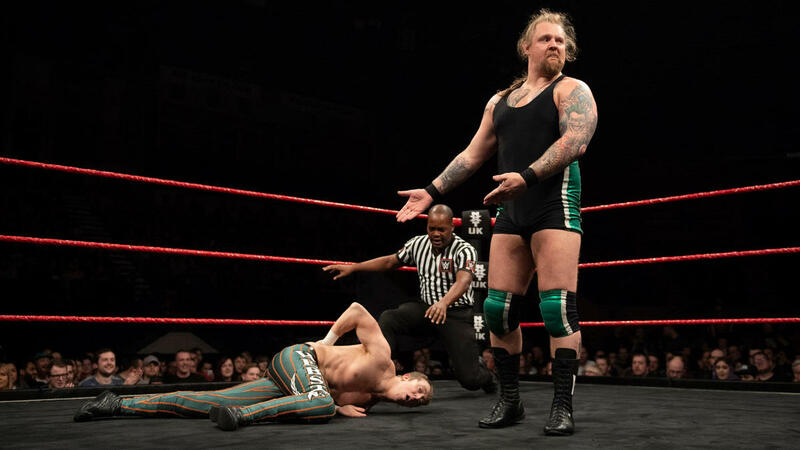 He said they were handed contracts and that it’s mind boggling that an American has to come to NXT UK to show them authentic British European style wrestling. He finishes by calling himself a wrestling genius. I really wish they would quit burying this guy already. Up next was Kenny Williams and Amir Jordan vs. Tyson T-Bone and Saxon Huxley. This match was OK. It didn’t really pick up until the finale when Williams and Jordan started doing some acrobatic moves. Amir finishes the match with a long distance Swanton bomb. There was a couple of promos after the match. First off, Jinny says she’s only after the NXT UK Women’s Championship and is sick and tired of hearing about Toni Storm. Next up, Eddie Dennis informs us he is taking on Ligero next week and even though he respects him, he’s in the wrong place at the wrong time. Dennis advises that Ligero is the first victim in a long line. The third promo takes place back in the ring with Noam Dar. He says he is here to stay and during a rant that starts to get the crowd booing him Mark Andrews interrupts. Andrews enters the ring, Dar tries to do a cheap shot but Andrews answers with a kick and Dar leaves the ring. And last, Xia Brookside calls out Rhea Ripley and calls her a bully. I don’t know if Brookside is ready for that. Brookside just had her first NXT UK victory and I don’t see that streak continuing through Ripley. After what seemed like an hour of promos, the next match was Candy Floss vs. Kay Lee Ray. This was all Ray. Not the most exciting match but the ending was brutal for Floss. Ray delivered the most massive slap from a woman I can think of. This was followed by a super kick, then her Widow’s Peak. It was a nice exclamation point ending. For the main event of this week’s show we got the Coffey Brothers against WALTER and Pete Dunne. This was basically an ‘anything you can do, I can do better’ match with WALTER and Dunne. And the majority of the offense came from them as well. Not only that, we were treated to not only one but THREE of WALTER’s apocalyptic slaps. This match was pretty entertaining. The finale consisted of WALTER and Dunne having a stare down, for whatever reason, in the ring. Mark Coffey came into with Dunne’s Title but was greeted with a big boot from WALTER. This was followed by his power bomb and the win. After the match, Dunne tried to pick up hits belt but WALTER stepped on it. WALTER though picked it up himself and handed him the belt, then left the ring. And that does it for this week’s NXT UK. Next week we’ll see Primate and Wild Boar in tag team action. And the main event is Bate one on one with Drake. Thanks for reading and long live wrestling.